(CNN) - After repeatedly pinning the president for the unemployment level, which now sits at 8.1%, Mitt Romney pledged he could cut the rate by two points if he makes it to the White House. "I can tell you that over a period of four years, by virtue of the policies that we'd put in place, we'd get the unemployment rate down to 6%, and perhaps a little lower," the presumptive GOP nominee said in a TIME interview published Wednesday. The number marked the first time Romney had talked about a specific rate during this election cycle, although he listed 5.9% as the number he would strive for in his 59-point economic plan released in September. And economic forecasts suggest he may not be too far off. Based on the current rate of growth, the jobless rate is expected to fall to around 7% by the end of 2015, and 5.5% by the end of 2017, according to reports by the bipartisan Congressional Budget Office. 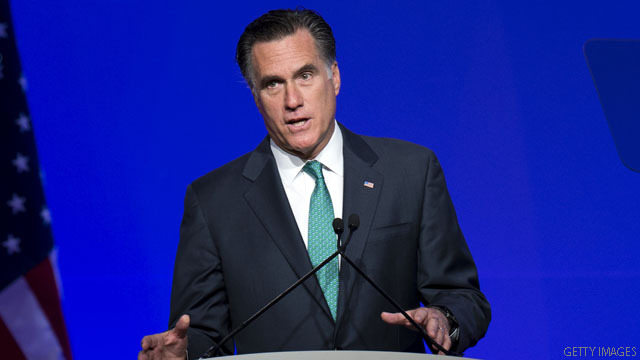 Romney has used the unemployment rate as a main line of attack against President Barack Obama. His campaign frequently points to a 2009 interview in which the president said if his administration could not get the economy turned around in three years, "then there is going to be a one-term proposition." At the worst of the recession, the unemployment rate reached 10% in October 2009, nine months after Obama took office. It has gradually dropped to its current rate at just over 8%, though some experts attribute the lower rate to the fact that more Americans are leaving the workforce. The CBO expects the rate to remain above 8% for the rest of this year and next year. In a conference call Wednesday, Obama campaign spokesman Ben LaBolt pointed to those predictions in criticizing Romney's statement. "Government economists have been clear that under current law their projection today is that unemployment will hit 6% by that point," LaBolt said. He went on to cite recent remarks in which Romney, chiding the president for his job creation record, said any unemployment figure above 4% was not worth celebrating. "What I think was interesting about this is that Romney moved goal posts in a matter of weeks," LaBolt said. "He said he was going to get it down to 4% several weeks ago, now he's at 6%, he's already moved the goal posts on a critical promise he made." In his previous remarks, Romney did not explicitly say he would reduce the unemployment rate to 4%. At a campaign stop in Pittsburgh in May, he said "anything over 8%, anything near 8%, anything over 4% is not cause for celebration." "Anything over 4% is not cause for celebration". Now he's promising to get it to 6% after 4 years. I'm not celebrating. I also think that Mitt is following in John Kerry's footsteps by waffling. Mitt cannot be taken on his word because as you can see, his words keep changing. Look at Romney's economic record in Massachusetts – dismal. The state's economy went backwards, badly, in his administration as Governor. Anyone can make promises, the record is reality. Romney's record is bad. Obama's policies are just plain sorry – vote for Romney and get your job back, make some money and enjoy life. We must kick the current president out on his ears. He is a murderer and a crook. He is an angry black man looking to punish enemies (read white america). He is not a compromiser nor someone who can bring people together. OK, so how do we get there, just like every other politician he has no specifics so he can promise anything he wants to. What happened to the days when guys like Ross Perot published a book on how he would do business and turn things around. Unlike these stereotypical politicians, Perot left a measure of accountability for himself, because if he failed, the book was all the ammo his opponents needed. This is a no brainer. Reversng the anti-business, wealth redistribution, entitlement culture of Obama will easily accomplish what Romney is claiming. Really? What "antiibusiness blah, blah, balh" are could you possibly be talking about? Major corporations are doing better today than they were before the crash in 2008. Banks are doing better today and making bigger profits than they were before the crash in 2008. Wall Street investors and the job creators are doing better today than they were before the crash in 2008. So, how come the middle class is stuck in a rut? The middle class has been stuck in a rut, decaying away for at least the past 3 decades, due in large part to trickle down economics fiscal policies. The middle class has seen their incomes flatline, and their buying power decline. The problem isn't on the supply side of things as much as it is on the demand side of things. The main reason the auto industry is doing well is because folks stopped buying cars for a few years, and now *demand* is high as they try to replace their older failing vehicles. The economy needs to increase demand to drive it out of recession, and into a growth phase. Cut it out Rich...too early in the day for me to be laughing hysterically!!! Hilarious!!! As governor Mitt Romney's Massachussetts was 47th in job creation but I just did some research and discovered that Mitt did in fact create alot more jobs than he's being given credit for! You see, as governor of MA, Mitt Romney was able to reduce the unemployment rate to 4%, that is in China, Switzerland and the Cayman Island! See, Mitt shipped all the jobs in MA to China then he created jobs in Switzerland and the Cayman Island in the banking system where thousands of locals are assigned to the daily task of counting his gold bars! And guess who just got citizenship in Switzerland? Michele Bachmann! She's board chairwoman overseeing the handling of Mittens millions he stole from the people of MA! That is a job creator for you! Big deal. If he were elected he'd learn soon enough that he has no more control over the unemployment rate than he does the weather. Why not be bold and promise zero or 1%? It's just campaign talk. Obama – The first president to preside over the LOSS of the net number of jobs in this country. Romney – A proven leader who knows how our economy works and has the experience to get this country CREATING jobs once again. Obama – Four more years of clueless leftist gimmicks and economic manipulation, followed by excuses and fingerpointing when it fails. Romney – A leader that has PROVEN he knows what it takes to turn the Obama mess around. This person will apparently say anything, and I do mean "ANYTHING", to get elected. This is the same guy that has said some of the "dumbest" things that any canidadate has said in history. I can't believe that people are honestly supporting this Guy. I would rather have George Bush than Romney. Can you imagine this guy as Commander In Chief in command of NUCLEAR WEAPONS? PLEASE, PLEASE, PLEASE Don't vote this person into office. He is CLEARLY unqualified for the position. Other world leaders already have a negative opinion of this Guy. One thing I never hear mentioned by any politicians, with regards to the economy and jobs is the fact that work has change substantially in the last 30 years. We have an aging population and there is a lot of under-skilled, under educated people who have lost their low end (but decent paying jobs – like manufacturing) The modern workforce is more intellectual these days and less manual labour. A lot of these people do not have the modern skill sets to compete for the best jobs of today. There are actually a lot of jobs available in America today especially in the scientific and technology fields – trouble is – there just isn't nearly enough qualified people to fill these positions. America's education levels are some of the poorest in the civilized world, especially in mathematics and science. Those are the real issues. Sure people have quit looking for work because they can't compete in the modern world. People need to take personal responsibility and get their skills up to snuff and move to where jobs are located. I though the gop was all about personal responsibility and keeping the government out of our lives as much as possible? – but then it's the governement's responsibility to create jobs? Nonesense! that is talking out of both sides of your mouth. – It is the millionaire business owners and corporations who are supposed to creat jobs, instead of constantly raking in record earnings. And judging that President Obama has seen almost three years of private sector job growth, while trimming back government jobs with absolutely NO HELP WHATSOEVER from the gop – things are not as bad as we are led to believe. 1) The Congressional Budget Office (CBO) has reported that unemployment will get to 6% by about 2016 if we continue President Obama's policies. So Mittens' claim is misleading, because this rate will go down EVEN IF HE DOES NOTHING. 2) A couple weeks ago, Mittens said that we shouldn't cheer the fact that the unemployment rate has gone down to 8.1% because anything above 4% if a failure on the part of the Obama Administration. (BTW, the last time we hit 4% was in the last year of the Clinton Administration). According to Mittens, he's promising to get the unemployment rate to 6% (which it will do anyway, as long as we follow the current policies in place from President Obama) and that's a great thing – but any rate above 4% under President Obama is a failure. Do you Repubs even BOTHER to think about the drivel coming out of Mittens' mouth or are you just too dumb and scared to actually try to use your brains? "I can tell you that over a period of four years, by virtue of the policies that we'd put in place, we'd get the unemployment rate down to 6%, and perhaps a little lower," Oh yea? I'll give everyone a miniature pony. See, I can make quixotic promises too. The CBO projection is 5.5% unemployment by the end of 2017. It doesn't matter who the President is. So current economic forecasts say the unemployment rate will be under 6% in less than 5 yrs, regardless of what Romney does? Isn't this a little like taking credit for the sun coming up in the morning? @john, sorry bud but that's a lie. When shrub left office people were losing their jobs left and right. Something like 750,000 per month. Job growth has increased under President Obama and it could be better than this if the treasonous congress would work with the President instead of against him. These people have done absolutely nothing to help our economy get back on track. Vote all the rethugs out in November. Yeah, and his friend promised Moon and gas below $2 per gallon. Is it April Fools today? @blake: "This is a no brainer. Reversng the anti-business, wealth redistribution, entitlement culture of Obama will easily accomplish what Romney is claiming." If President Obama is so "anti-business," then why is the stock market over 12,000? Why is GM the top auto maker in the world? (BTW, private equity companies like Bain didn't want to help the auto industry; they'd rather it go under, taking the million supply chain jobs down with it.) Why are we now exporting oil? Why is the unemployment down, heading towards 6% by 2016 (according to the Congressional Budget Office)? If you're looking for wealth redistribution, look no further than the GOP whose policies have resulted in the top 1% see their income rise 570% over the last 30 years while the Middle Class has seen their wages stay the same or go down. And talk about entitlements! What's with subsidizing to the tune of millions of dollars the oil industry, which is enjoying record profits? Or all the tax incentives for companies that ship American jobs overseas? Or taking capital gains at 15% for folks like Mittens who invest other people's money, when the capital gains rate was originally to reward folks who actually took a chance with their OWN money? Unplug yourself from Fox and try actually THINKING for a change; you may have to suffer the agony of admitting you're wrong, but at least you'll stop sounding like a fool. First he needs to learn how to create jobs before he can make such a crazy promise. I do not think he has a clue, he is so use to destroying Americans Jobs and sending them over seas. I think Meg Whitman made promises something like that too, when running for office – might want to check with the huge number of HP employees she is laying off, to get their real life proof. Careful what you believe! Romney wait untill next week and see what the government economists says & once again you can move the goal post. Since you seem to always be a follower and not a leader. at least he makes a clear promise not the vague 'hope and change'. Anyone can make a promise. Vote for me, and I promose I will get unemployment down to 2%. Ok, so I made a promise. That automatically means I will keep it? That automatically means people have to vote for me? A president cannot enact anything without congress, unless he wants to sign a truckload of executive orders. How is he going to guarantee that congress will sign off on any of his plans? Promising something that is likely to happen anyway. Smart. I promise that if you elect me president, grass will be green next year, the sky will be blue, and you will have oxygen to breathe. Vote for me!